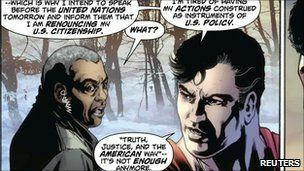 Superman intends to give up his US citizenship, a story in the new issue of Action Comics declares. "I'm tired of having my actions construed as instruments of US policy," the character says in a story that sees him flying to a Tehran protest. Adopted by an American family, Superman decides he is better-off serving the world. Though he only talks about his plans to give up citizenship, the story has been criticised by commentators worldwide. The superhero, originally from the fictional planet Krypton, does not clearly renounce his citizenship in the issue. Action Comics co-publishers Jim Lee and Dan DiDio said: "Superman announces his intention to put a global focus on his never ending battle, but he remains, as always, committed to his adopted home and his roots as a Kansas farm boy from Smallville." The disputed story sees the hero standing silently at the protest, wanting to show demonstrators that they are not alone. Superman's announcement comes after accusations from Iran's government that he has caused an international incident, in the nine-page story written by David Goyer. "'Truth, justice and the American way' - it's not enough anymore," Superman says, "The world is too small, too connected." This is not the first time a comic character has distanced himself from US policy. In the 1970s, Marvel Comics' Captain America swapped his identity for that of the character Nomad at the time of the Watergate scandal.